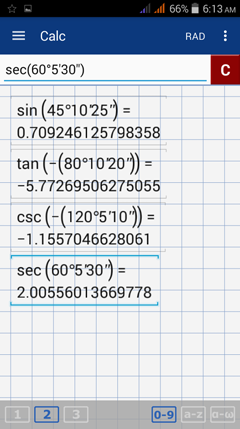 1) Enter the trigonometric function you want to use. In this example, we will use sine. 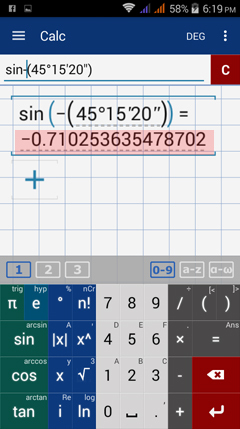 2) Tap the open parentheses before entering the angle in degrees. Make sure to add the degree symbol. 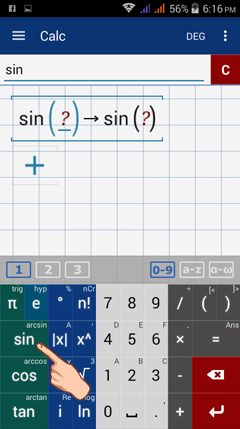 3) Type in the minutes and tap the 1st derivative key (tap the exponent key twice). 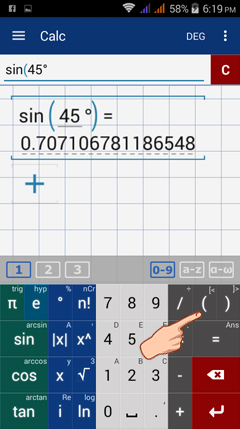 4) Type in the number of seconds and add the 2nd derivative key (tap the exponent key three times). Then add closed parentheses. Note: To enter a negative angle, enter the trigonometric function followed by a negative sign and then enter the argument in parentheses. a) sin 45º 10' 25"
d) sec 60º 5' 30"
Enter each expression as given. 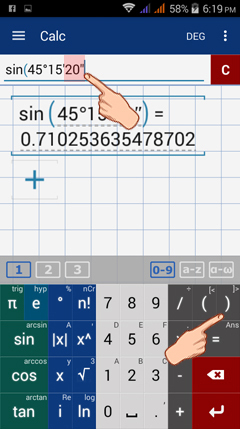 Use minutes by tapping the exponent key x^ twice. Use seconds by tapping the exponent key x^n three times. Place the negative sign outside of the measure as shown below. Enter cosecant by tapping sin three times. Enter secant by tapping cos three times.